The allotment can be a demanding diva; always wanting my attention, needing constant pampering, making promises she can’t keep, ‘what happened to the brussel sprouts you promised me?’ All the while quietly motoring on in the background is our beloved garden. Doesn’t fuss, doesn’t complain, she just gets on with it, producing abundant displays of floral beauty. I’ll always love the garden, after all, she was the lady who opened a whole world to me that I never knew existed. So it’s only right with autumn steaming headlong into winter, that this weekend I spent some quality time in the garden, letting her know I still appreciated her, and giving her the focus she deserves in order to tackle the coming chilly months. We still have a few things growing but this weekend, it was time for mulching, separating perennials and re-positioning the 1001 Foxgloves I grow every year from seed. It was also time for planting bulbs and, of course, making homes for the creatures and animals that stop by in our little oasis over the colder months. 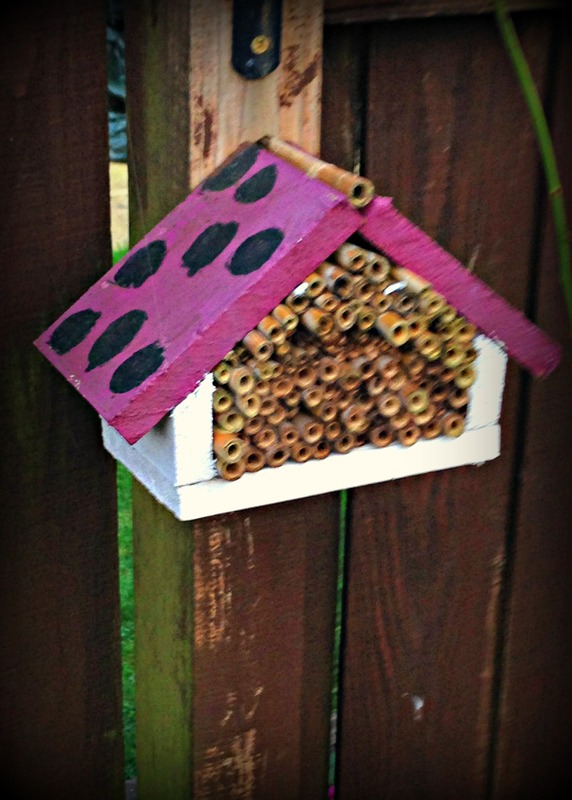 We all hear about how we need to protect the garden wildlife, from bugs to bees to butterflies. They all play their part in sustaining our gardens and if we want our little corners of heaven to survive, then we must return the favour when the winter nights draw in. Our gardens are like botanical veins, weaving their way across inner city and suburban landscapes until they reach the countryside and open up. They’re all linked to a bigger picture, acting as roadways for wildlife as they travel through these urban spaces before reaching their final destination. But like all motorways, you need the service station for rest, refuelling and a place of safety, and it’s very important to provide these spaces for wildlife in our back gardens. So I ensured the bird table was clean and sturdy, I placed logs throughout the garden for bugs and small mammals, and checked and cleaned the various birdhouses. But, most importantly, I had to check the the masterpiece that I had previously built from scratch, my jewel in the crown, my very own five-star establishment, ‘the ladybird hotel’. Now, although I’m in a very loving relationship, there have been occassions when the ‘ladybird hotel’ has made me question my marriage. ‘Why?’ I hear you cry, ‘But you seem quite the catch, dear boy!’ Oh, come on now, stop there or you will make me blush… But you see, everytime there is the mention of the ‘ladybird hotel’ or it catches Soph’s eye whilst out in the garden, she does not see it as a place of sanctuary for the ladybirds. Oh no, she regards it as a thing of perpetual amusement and it never fails to cause an eruption of giggles. I have explained (on numerous occasions) that I know the paintwork isn’t the best, and it was the only paint I could find in the shed at the time of construction, and actually, I find the polka dot motif rather stylish. But no what really turns the suppressed giggling into hysterical fits of laughter is that, to this date, my ladybird hotel has never had one sodding guest! That’s right, it’s been there for two years and I’ve never seen anything crawl in or come out. It got so desperate one summer morning last year that Soph came out to find me picking up various bugs and trying to force them into the hotel. It was like watching a scene with Basil Fawlty as he paraded round instructing ladybirds to accept his goodwill. To make it worse, Sophie had seemingly donned the role of Sybil: it didn’t matter how hard I tried to explain that I was doing a good thing, she would only roll her eyes at me as I continued to jump up and down and beat my crude construction with a broken Iris: ‘You will accept my hospitality, bugs, enjoy my hotel!’. But any bugs I had placed in the hotel had already decided that a weekend caravanning in Clacton was preferable to this, and had apparently buggered off. However, keep faith dependable reader for if winter is going to be as severe as they predict, then I will have the last laugh. Oh yes, I’ll be rolling in the ladybird currency this Christmas, mark my words, this is a business that is about to boom.. It better had, as I’m about to build a second one and I can’t afford any further mockery from my wife. I’ve never seen any bugs in our little ‘hotel’ either, if that’s any consolation!